Amara spent the night with us last night and we had such a great time. She had brought with her the Glow in the Dark Chalk kit that she had gotten for her birthday last week from Uncle Mark and Aunt Sandy and she could hardly wait to get started. I read the directions and it said for best results you should wait and make it at dusk so that you get the ultimate in glow power. Waiting is hard and we needed something to do when Amara remembered there were balloons left over from her party. 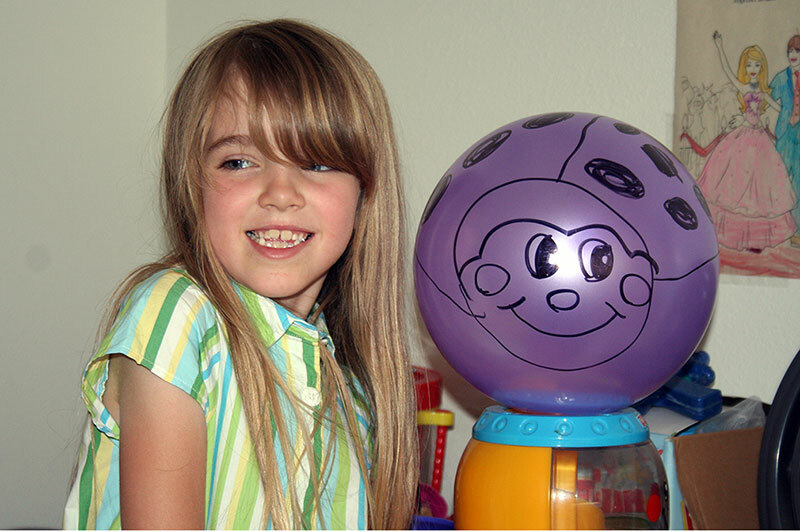 We started out just having fun blowing them up when I got the idea to turn the red balloon into a ladybug and that was just the beginning. Amara made purple and pink ladybugs, a yellow sun, a blue domino (I don’t know), a pink butterfly, a green sword to club Grampy with and a green Evil Witch! I tied most of the balloons and Amara did all the drawing. She has named it Balloon Art and she told me she is glad we discovered it. This was followed by the Glow in the Dark Chalk event which was actually a 2 parter. First we had to make the chalk which involved a lot of shaking of the jar which meant a lot of dancing by Amara! Those feet just cannot stand still and it was fun! You make the chalks 2 at a time, measure, shake, pour and repeat. Then you have to let them dry for 30 minute. I waited longer than that. I think they would have popped out better sooner but I kept thinking they weren’t dry yet. The very last one we did was the wettest and popped out the easiest. While they dried we had dinner and started her new Barbie movie – also a birthday gift. It was Barbie and the Nutcracker and she loved the dancing and did some of her own. 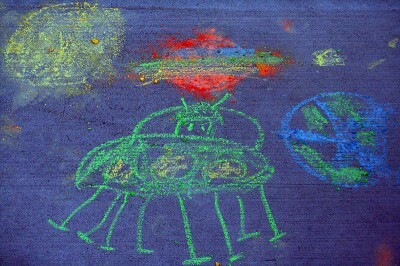 But time out from the movie and onto the important stuff — drawing with our new Glow in the Dark Chalk. Amara loves to draw and she has been learning a lot about the planets in school and since this was glow in the dark… she drew planets. 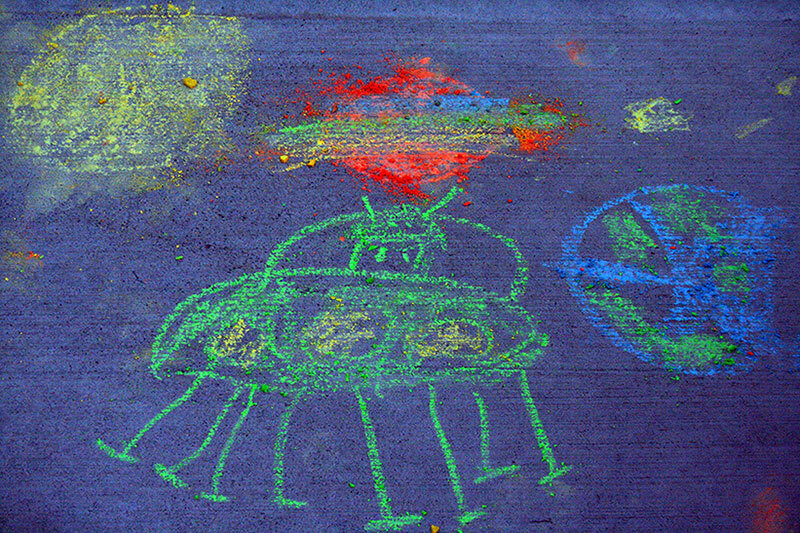 And she drew an alien spaceship complete with alien. AND a rainbow with a pot of gold and a leprechaun! It was beautiful and when she was done we went back inside for a Popsicle and the rest of the movie. We kept pausing the movie and going back outside to check out how things were glowing. This morning Amara patiently waited for it to be 9 AM so that we could go outside and she could play slip and slide and create some more chalk masterpieces. We get pretty crazy out there and so we make her wait until after 9 to go out and play and wake all the neighbors otherwise she would have been out there by 7:30. We had wonderful weather even though it is very windy and she had a blast sliding. She finally looks at me and says “I’m ready for my bubble bath — a nice long one”. And it was. One final bit of craziness before Mommy and Daddy arrive. We played “keep away” with that green balloon that was the Evil Witch and her toy badminton racquets in the living room. I figured if we were careful nothing could get hurt — what can a balloon break? I can’t believe how long we played with that balloon and it didn’t burst! We were hitting it pretty hard. So we decided to take it outside. The wind immediately grabbed it and it was off down the street. We heard it! Our wonderful weekend ended with a Pop! This memory was posted in Outdoors Fun and tagged Amara, art, balloon art, Barbie, chalk, slip and slide on May 1, 2011 by Grandma Kc. Amara has an awesome imagination. I love the balloon art! And I’ll have to look for that homemade chalk kit. I never knew there was such a thing, but how cool is that! It was a great weekend. The balloon wars were awesome. I was dreading Amara getting older, but she just gets to be more fun all the time, And since we have all the pictures and video we don’t lose the experiences from when she was little. She did a great job with the glow in the dark chalk! It’s such a cool looking space ship! I love the balloon art idea!! I think we will have to try that the next time we see the grandkids! And definitely we will find some of that glow in the dark chalk to try at our house!! And when you try the balloon art and you try the glow in the dark chalk — I want pictures! There will definitely be pictures!! You and Amara have so much fun that I almost want to be a kid again, just so I could visit Amaraland! You can come play with us anytime! How did you ever survive all you did that day? How much is the glow in the dark chalk? Hi Jazzy, You can get it at Target for $9.99 and it makes 8 pieces. Definitely thought it was worth it and she loved it. I can see the artistic talent already in full bloom two years ago when this event happened! And of course, there’s that “knock em dead” smile again! Reading this again made me wonder how often you and Amara peruse the old posts. It must be such a joy to sit together and relive the fun you’ve had! Thanks for sharing in the GRAND Social. No One is every going to accuse you of being a bad grandma! Lovely the glow in the dark chalk. Can’t get that product in New Zealand, I know Lucy would just love it. Hope Amara had a wonderful birthday. So fun to read about you and Amara time! There’s a Family Circus cartoon on my frig that says “Grandma and I like hanging out together” and this sure fits the two of you! I’ve been cautious with balloons for the Littles….but now they’re five and would love this! Is Glow in the Dark chalk pretty available everywhere? Using them with the badminton racquets is a great idea….thanks for this awesome post…..I’m just reading for the first time. So glad we’re “allowed” to post oldies but goodies! Stopping by for a visit from the Grand Social. What fun times you have with your granddaughter. I love the art on the balloon idea. I’m going to have to try that one with my grandson. Can’t wait to grab some of that glow in the dark chalk for the next family get together! That Amara is one lucky girl!